I do so love Syr’nj in that last panel. She is looking for the “You’ve been poisoned!” sticker. I think she’s more looking for where her drink went. Or at least wondering what the heck was in her drink. “Whoa! Bandit?! But she’s supposed to be dead!!!! Yep thats my guess too! Mead is golden in colour… not brown… unless someone took a dump in it. Syr’Nj sees dead people when she’s drunk? She must be a mead-ium. Spilling her mead like that…It’s alcohol abuse! Suddenly questioning reality? It’s okay! Just blame the mead getting the voices in your head drunk. I love Bandit’s nonchalance. I can’t wait to hear her explanation, though. Don’t think it’s purposeful nonchalance. From her perspective probably nothing out of the ordinary has happened since everyone’s in on “The Secret” except for our main protagonists. Well I made a point of carrying a journal which just happened to have a sachet of ketchup being used as a bookmark… point of fact axe boy you owe me a new diary and a supply of ketchup! … It was a big sachet? No… I believe “just a flesh wound” was merely a continuation of the Green Knight from Monty Python’s Holy Grail. Unless you refer to something else, in which case, this post can be disregarded. I think Thracecius was refering to the I got better line. …What was IN that ale? You know. I don’t care how Bandit is back or where Best has gone. I’m just happy that Bandit is back and Best is gone. Amen to that, brother. I hated Best and his ridiculous ego. With Bandit, you know where you stand: Behind her, where you can keep an eye on her, and make sure that you still have all your stuff. Well if they’re the same person, he can log in at the same time as herself. Definitely dual-boxing, the Best char distracts with /silly, then the Bandit char picks pockets. Totally immersive gaming plus Multiple Personality Disorder? Old rule, from the first year of D&D: When in doubt, pick up the thief by the ankles and shake. I’m like 67% sure Best and Bandit are the same person. Likewise glad that Best is gone, for the time being, and Bandit is back. Mainly posting to see what my random avatar is. Whoa! Look at that dude! i think mine accurately sums up today’s comic. I’m afraid to post with mine because it looks like a romantic moment for GRAVEDUST DESERTHAMMER (You have to say it in all caps) and Syr’nj. Bandit is actually a hacker who hacked the demo the 5 others were playing. She simply relogged after dying. But now she hacked in 3 other dudes, and told them about the main 5.
who cares about the how? she is back .she is back.she is baaaaack. And best is gone (And will hopefully never return). that is all that counts. Argh again? why do i allways end up with this avatar,thought it was random. oh well live is ironic. I suspect there’s a cookie that makes sure you keep the same random avatar. It is only randomly assigned once. It’s not a cookie. I guess it is connected to your name, however Phil hinted that those connections will be jumbled when new avatars are added (perhaps avatar = loginId mod numberOfAvatars or something like that?). I believe they’ll jumble themselves up, yes. It’s possible that they won’t, and simply newer readers will have a chance at getting newer avatars. The way it works is that I’m physically changing the directory in which avatars are drawn from, and I theorize that changing the avatar set in Comicpress will cause everyone to get re-assigned. I’m excited to see how it goes down, personally. oh well at least my avatar is an action scene. Actually, wait, nevermind, this new one isn’t half bad. I like Syringe. Syr’Nj, even. This is what happens when you post during swing shifts. And now you appear to be red psycho Frigg. Agreed. Very happy to see Bandit’s return. I REALLY dig the design and color scheme of that elf. Those cuffs are glorious. All the better to epically fail at hauling him up from a horrifying falling death with. Gloves with cuffs on them seem to be the style for scoundrels. And cut off fingers as well. Might be some relation to Hakurei Reimu’s impossible sleeves. They’re Chippendale cuffs. He’s bard/dancer multiclass. Ten bucks says that they lose Bandit and get Best back within the next…say…four chapters. Hmmm, have we ever seen Bandit and Best together? Because they bear a superficial resemblance to each other, and as this is based off a MMO, maybe one of the other is an alt of the other? Or I had some of that mead that makes me see things. I don’t think it’s really possible for someone in the full-immersion tank to have an alt. It would completely ruin the whole “I think this is my real life” deal the rest have going. Obviously their alt is what happens in their dreams. Am I a Bard dreaming I’m a Thief or am I a Thief dreaming I’m a Bard? Or a bowling ball dreaming I’m a plate of sashimi? Never assume what you see and feel is real! What if the tube dude has a multiple personality disorder? On the page after that too. Thanks, my brain is at peace, sorta. Any bets Frigg is going to have Bandit’s top off in the next panel, checking for scars? And then they’ll have to wrestle in chocolate pudding, also to check for scars. Cooking oil is really much more effective when looking for scars actually. Chocolate pudding is too opaque for the job. Wouldn’t want poor frigg to spend half an hour wrestling in chocolate pudding only to be told she has to wash up and start over in this pool of olive oil would you? I really doubt we’re about to have an ‘OOC’ discussion here. It H.R. Puffenstuff’s got any brains at all, he’s placed our feckless fivesome onto a test server, away from the rest of the general gaming population. …Wow, this was supposed to go somewhere else entirely. How the hell did that happen? Depends. The White Queen might also have to be inspected for scars. In that case, they’d have to wrestle twice any way, so may as well. So umm, did Bandit hop on to the chair from somewhere or did she simply “log on”? There’s motion lines indicating jumping onto the stool. And assuming she’s a PC (seems unlikely…never seen that in-depth role playing in an MMO – it works for the others since they’ve got it enforced), and the ‘thump’ indicates her logging on, that’s a HELLA fast reaction to seeing the others. Also, Tombdirt Gravedust seems to notice her walking towards the group in panel 2 while Frigg is talking to the nun. Love Byron getting his dose of super-confuz. That isn’t ale! That isn’t cider! It’s Johnny Jump Up! Damn you for introducing a question last strip, not answering it in this strip and then posing ANOTHER mystery! DYING IN ANTICIPATION. They do that *every time*! Not *every* time…When Best was cliffhanging, they didn’t leave us with a cliffhanger then, did they? …anyway, since when does mead foam like that? Yes, I know that mean can be carbonated; but that’s a veritable head of foam there being handed to Syr’nj in Panel 1. There’s something… odd… going on in whatever brewery supplies this inn.
. . . 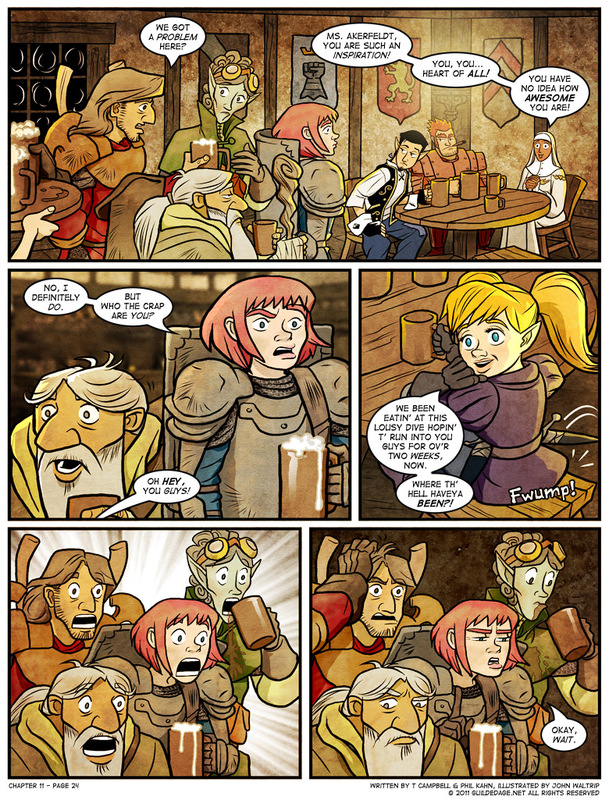 I too was about to post something snarky about foamy mead, but then I realized that I’m reading a webcomic about people who are trapped in a fantasy MMORPG. The mead is the one thing I find out-of-the-ordinary enough to comment on? Really? Dude. It’s BOOZE. Booze is important. Syr’nj wanted mead. Everyone else got beer. Nice alt-text. Is that a Gunnerkrigg Court reference? Lucky for Syr, the mead will eventually get down to where she can drink it via her roots. The first one is Gravy the Pooh, the second one is more like Gravebert Einhammer. Clearly it is now a possibility that Bandit was a traitor who was resurrected by her real employer. Because why else would her dead body have been separated from the rest of the dead bodies? Gravedust will have to go to the bottom of this! NPCs never truly die, they just respawn after a few minutes. Now that she has some booze Frigg is about to do some heavy thinking. Well, I honestly didn’t see that coming. Is Bandit a non-immersion PC, then? If she were an NPC, I’d expect her to stay dead. If this is Daedalus’s character as many of us have speculated, then what is he trying to accomplish here? Is he going to waive the video game mechanics in their face to try to break the world’s hold on them? The mechanics of their face will never waver. I’m happy, actually. I missed that little runt. *Rubs his eyes in disbelief* Okay, now I need a drink! And the tiny one returns! It’s hard to state how small the fucks are that I give about Bandit. Small like Bandit herself, I suppose. The avatar gods scoff at you! Bandit and Best were in same comic on Nov. 18 & Nov. 20, 2009; so maybe Bandit was originally an NPC. It seems to me that Bandit has more than a passing resemblance to Best now [cryptic comments Phil?]. I think the resemblance is in your eyes only, pardner. Pfffft! Nice try Phil. I know that your words are just a clever ruse designed to divert us from the TRUTH! Well played, sir. Well played.
. . . Now I don’t know what to believe. I thought I knew what to think I belived but now I believe I don’t know what I believe to be thinking. In this strip she seems to look a lot more like Mr. Purple Tie. Hah! Called it. Admittedly late on a Sunday night. But still, go back a page and there I am. Calling it. Because I’m a caller. Someone called it last page, but hell if I’m going to go back there to find out who to give the credit to. Hmmm… in honour of Bandit’s return, I think I’ll steal the credit. Yes. I TOTALLY CALLED IT. Ninja’d, damn. And by someone with an actual claim. That’s cheating! Bandit has stolen her own life from the icy clutches of death itself, this is the greatest act of filchery imaginable. …which ironically means she has peaked and has nothing left to live for. Truly this is the saddest development possible. Creeeeepy. :) Be careful what you wish for. It IS really interesting that she and Best are never seen together. Wondering what’s up with that. As mentioned too many times above, chapter two, pages 6-8. I have far too many questions to be even capable of speculating, analyzing, or opinionating right now. Well, if she was going to be porking someone, why didn’t she make sure they had some meat on ’em? Otherwise, there just isn’t any point to jumping his bones. You hafta pick whomever get you over the river I s’ppose… Though one can dream. Which is interesting because the only reason they are alive is because of Gravedust…and he seemed like he didn’t bring Bandit back…so how the heck is she alive again? And who are her friends? Though we now know that Byron clearly does not have Great Cleave-age. He was only ability to kill one friend per round.
. . . while she was practising her filchery on your valubles. PS oh, and bravo, in case Phil’s golden starryiness wasn’t commendation enough. “Oh, it’s you. It’s been a long time. How have you been? I’ve been really busy being dead… after you murdered me. There has to be a +1 button for this somewhere. Defensive Roll, always take it! All hail the return of Bandit! She took and rolled an unmodified 1. Dang, this should be interesting to hear. Bandit’s arms are looking awfully ATTACHED to her torso right now which I wasn’t expecting. Good to see though. This puts one of my fears at rest, if they’ve been waiting around for two weeks for our guys to show up they can’t have simply been forgotten. Unless its to inform them they’re out of a job I guess. First, this confirms for me that Bandit is a regular player-character, whose player finds nothing remarkable about respawning. Second, if she’s been waiting around for two weeks, wondering where our protagonists are, that implies she’s not played by Daedalus or Carole, who could presumably have used dev tools to find them at any time. Third, “we” have been waiting. Bandit is part of a band of adventurers who have been assembled for some reason. Who set them this task, and why? And on the assumption these are regular player-characters, they’ve shown extraordinary patience to wait that long. She could also be a liar. If she is truly played my Daedalus, it must be the case. The only thing she’s said, really, is that Bandit and her companions have been waiting there for two weeks — and Bandit would have to get her companions to go along with that. You could be right, but I think, by Occam’s Razor, Bandit isn’t Daedalus, and probably isn’t Carole, either. Guess the pre-requisite for fifth party member is “blonde hair, not so party-friendly behaviour and passion for good drama”. If Best comes back, we must also include “thought-you-were-dead experience”. I’m more curious about how Frigg suddenly has a fangirl and why. Especially when that fan is all hearts. She might be due for some heartbreak after spending some time with Frigg. See my reply here. Though I agree that she might be in for a surprise after an adventure with our ginger crusader. So. 5-1=5 or 8. Does that sum it up? Well. I have to confess, I assumed the chapter would end with Sepia Best waking up in a tube. Or someone declaring him dead. Mostly the former. Now…will the next chapter be back to Sepia World, leaving us hanging on this matter? I still think Bandit’s an avatar of Mr. Dedalus’s assistant. Still hoping for Best to return, honestly. He’s a pompous douche, but that’s what makes him so enjoyable. Honestly, I wonder why more people don’t see it that way. He doesn’t have to be the kind of person you’d like in real life to be a likable character. In fact his likability as a character mostly stems from being the opposite of likable in real life for me. Are we sure it’s OUR bandit, and not just a bandit Archetype? She does recognize the rest of the cast. Unless all Bandits share a hive mind, this would seem to be OUR Bandit. All hail the Bandit Queen! Bandit is back! Now I can’t wait for the inevitable and undoubtedly confusing explanation… Or perhaps lack of explanation. Either way I intend to enjoy this. Now to open that bottle of wine and have a nice dinner in celebration. A small dinner mind you. It’s funny how Bandit’s return has completely overshadowed the awesomeness of Frigg’s, “No, I definitely do,” reply. Byron, clearly your axes have magic gnome-reviving powers; they cut into her, and then their powers revived her off screen. That could make a good party trick. Try it again! Yes, I realize where all this is really taking place, and I expect some ‘real world’ discussions about software glitches causing internal inconsistencies, etc, but it’s still nice to see Bandit back. Frigg sees what Bandit did there. Why is Gravedust just kind of looking off to the side in the last panel? Couldn’t it be possible that Bandit is an NPC? Her purpose is to help guides new players through the starting zones. These three people are all new players, and Bandit is guiding them through. I don’t think this is the case. As I said earlier, only an idiot would take the five and put them on a server with other players. They have to be on their own test server or the results of whatever experiment they’re running will be ruined. That doesn’t stop her from being an NPC meant to handle more players, it would just mean that the level of personal attention she’s giving them is partly the result of a lack of other players to look after. Even if they only have a few players to work with now, there’s no reason not to plan for scaling up. And my avatar made me LOL. BY ALL THAT IS WONDERFUL IN THE WORLD. YES.